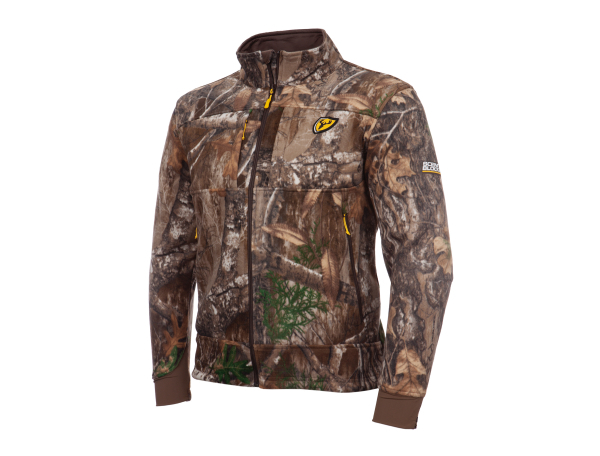 COLUMBUS, Georgia -- The new Adrenaline Jacket in Realtree EDGE camo is ScentBlocker’s top-line mid-season jacket. Built for those moments when the heart starts racing, Adrenaline features Cold Fusion Catalyst™ -- ScentBlocker’s top odor-controlling technology – combined with a 20 percent Merino wool fleece lining. Cold Fusion Catalyst uses unrivaled carbon technology that adsorbs odors on an atomic scale and creates a powerful physical bond to provide you with the ultimate in stealth. Add in natural wool fibers for strength, temperature regulation and comfort and you have gear that outperforms expectations in virtually any condition. This mid- to late-season jacket is absolutely dead silent with a soft, brushed face and micro-grid interior, and it pairs perfectly with the Adrenaline Pant for avid rut hunters who appreciate a serious scent-control regimen. You can see this and all the new Blocker Outdoors products on BlockerOutdoors.com. Realtree is the world's leading camouflage designer, marketer, and licensor with over 2,000 licensees utilizing the Realtree camouflage brand. Thousands of outdoor and lifestyle products are available in Realtree camouflage patterns. In addition, Realtree is committed to supporting individuals and groups that work to ensure our outdoor heritage, the conservation of natural places, and the wildlife that resides there. Find Realtree on Facebook, Instagram, Twitter and at Realtree.com.